Please fill out the secured online application if you would like to join CSC. Membership is $28 including shipping, which includes one CSC T-shirt (S,M,L,XL) and one CSC sticker. $2 more for larger size T-shirt. New CSC club gear can be picked up at the Tempe monthly meeting. 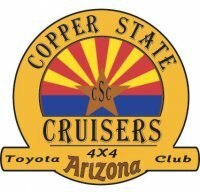 Wear your shirt and show your CSC support at the next Tempe and Tucson monthly Cruiser Meet.